Paisley has a long history and first came to prominence with the establishment of its abbey in the 12th Century. It became a centre a major religious significance in Scotland and Paisley Abbey is the burial place of several Scottish Kings from the Stewart dynasty in the 13th-15th Centuries. During a darker era in Paisley’s history it was the scene of a major witch hunt in 1697, which resulted in the execution of 5 local women. It was the last mass execution of those accused of witchcraft in the whole of Western Europe, and there is still a horse shoe symbol (traditionally used to ward off evil) marking the spot at Maxwellen Cross, where the remains of the so-called ‘Paisley Witches’ were buried. Paisley also has a long association with textiles and weaving and became well known for the distinctive pattern that bears the same name as the town. Paisley’s other famous exports include actors David Tenant, Tom Conti and Gerard Butler, and musicians Paolo Nutini and Gerry Rafferty. Public gatherings in Paisley may not always have had the most pleasant of outcomes in the past, the this is definitely not the case today. The Hog Roast Paisley team have spent many happy years ensuring the town’s residents and visitors all have a great time at events hosted in the town by providing them with great food and a sociable atmosphere. 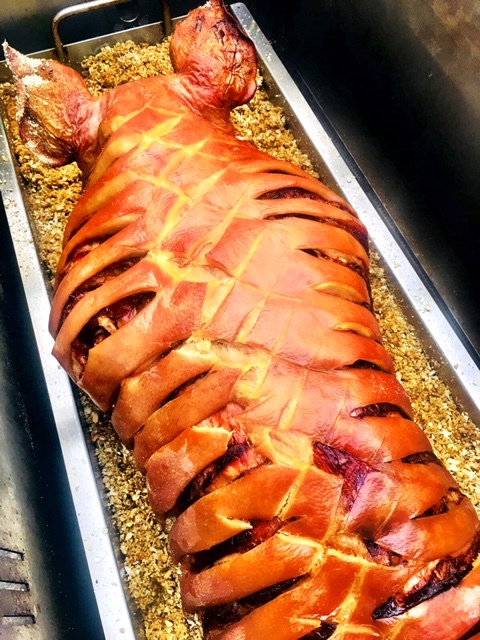 Our hog roast machines make great centre pieces for any type of special occasion, and most of our range are fitted with a heatproof glass panel so our diners can watch the meat as it slowly roasts. In our experience this has never failed to get tongues wagging and stomachs rumbling, especially as our multitalented Hog Roast Paisley catering team are also freshly preparing the rest of the menu options at the venue in full view of the guests whilst the meat is being delicately cooked over the course of several hours. Whether you are organising a formal event or a more relaxed informal gathering, with Hog Roast Paisley in charge of the catering, your guests will be treated to food fit for kings and an interactive dining experience like no other.